Serve up some luck with these delicious St. Patrick's Day desserts. They're perfect for a special party, school bake sales, sharing with the office, or just a little celebration at home. You and your taste buds will be dancing once you try them. 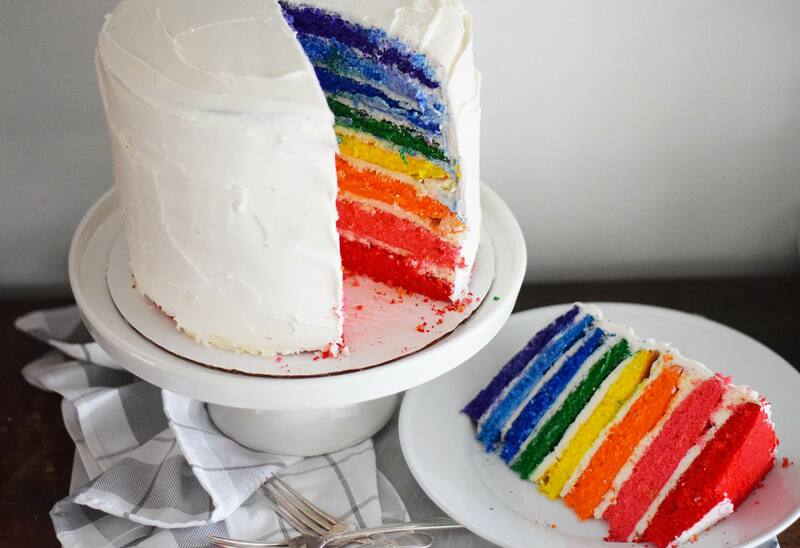 Cut into this showstopper rainbow cake and your guests will be completely in awe. It's as tasty as it is impressive, but much easier than you might think. Just combine the ingredients, stack, frost, and serve. You will need more food coloring than you expect to get those vibrant colors, as the dye will fade as the cake bakes. Add a few drops at a time until you reach a nice, saturated hue. If you love the minty creaminess of a grasshopper cocktail, you're going to want to whip up this easy no-bake pie. It has the same flavor (and a boozy kick, thanks to Creme de Menthe liqueur! ), but on a plate instead of in your glass. Because it's not baked, the alcohol will remain in this dessert, so this is a treat for grown-ups only. You don't have to hit the drive-through for the cult-favorite green milkshake. This homemade Shamrock Shake is as thick, creamy, and delightfully minty as the store-bought version. Whole milk, peppermint extract, vanilla ice cream, and—of course—some green food coloring to give it that signature hue are all you need to whip up a few. Don't forget whipped cream and a cherry on top! This eye-catching layered rainbow fudge will turn heads at your kids' bake sale, a St. Patrick's Day party, or even as a favor for a shower or other event. It's not difficult to make, but does require repeating the fudge-making process for each of the layers, so it takes some time. Adjust the amount of food coloring a few drops at a time, until you reach the desired intensity. 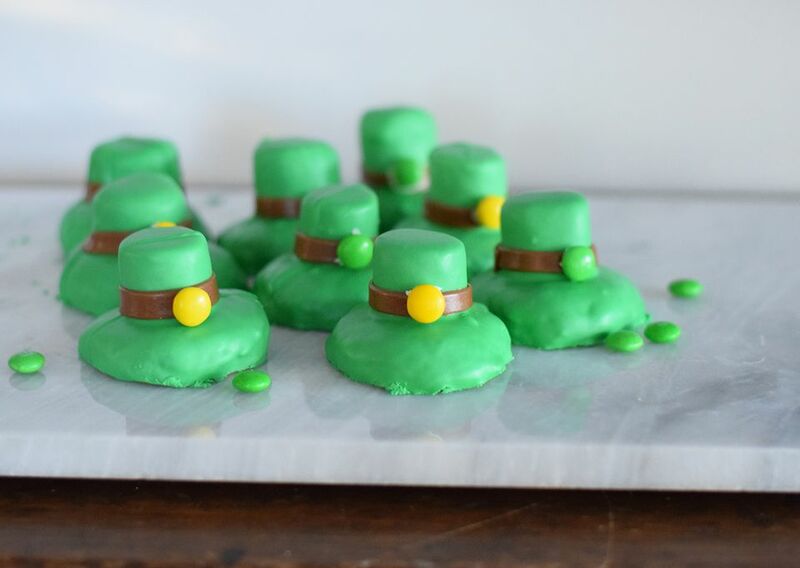 These adorable leprechaun hat cookies will have you jumping for joy and snapping a picture for good measure. They're easy enough to get the kids involved, especially if you use store-bought cookie dough and frosting to cut down on prep time. If you prefer to make your own, we've included recipes for you, too. Instead of the rice cereal typically used in these childhood-favorite treats, swap in Lucky Charms for a special St. Patrick's Day twist! Kids and kids-at-heart will get a kick out of the fun substitution, which gets an extra hit of sweetness because of the sugary cereal and little shaped marshmallows. The recipe is simple enough to get little ones into the kitchen, so make it a fun after-school activity. Cut-out cookies aren't just for Christmas anymore. Whether you're Irish all year-round or just "a little bit Irish" on St. Patrick's Day, you'll love these classic shamrock-shaped treats. Simple green and white frosting will be pretty and festive, but you can also decorate them with sprinkles or edible pearls for a little extra flair. Find the cutters online or at your favorite craft store. Adding a little Bailey's Irish Cream to the frosting for these rich chocolate cupcakes gives them an extra dose of flavor. They're perfect for St. Patrick's Day, but too delicious to make just once a year. If you're short on time, you can even bake the cupcakes in advance and freeze them undecorated to use later. Need a quick activity for a chilly day? Try these simple chocolate-covered shamrock pretzels! All you need is green candy coating and basic twist pretzels—it's the perfect activity for tiny hands. They're a tasty and cute little snack on their own, but also make great toppers for cakes or cupcakes. You may have tried an Irish car bomb, enjoyed by dropping a shot of Bailey's Irish Cream into a Guinness stout and tossing it all off in one foamy gulp. But if that's not your style -- or if it is! -- these Guinness and chocolate cupcakes with Bailey's-spiked frosting have some of the same flavors, with a hit of chocolate to boot. Once you try the bitter note Guinness adds to the velvety chocolate cake, you'll want to add it to all of your desserts. Decadent chocolate mousse is already perfect, but you can take things to the next level by adding Bailey's to the mix. Use good-quality chocolate for this deceptively easy mousse; it's really the star of the show. A shot of Irish cream liqueur deepens the flavor and gives these dinner party-worthy desserts an extra creaminess that guests will love. You won't want to relegate this recipe to St. Patrick's Day alone. Just because you avoid gluten, doesn't mean you should be left out of all the tasty St. Patrick's Day fun. This gluten-free cheesecake is sinfully rich, perfectly silky, and spiked with a little Irish cream for extra creaminess. Cut it into thin slivers and serve with a dollop of whipped cream and some fresh berries for an intensely delicious chocolate dessert. Whether you're celebrating St. Patrick's Day under sunny skies or still bundled up for early spring chills, this boozy coffee cocktail is the perfect celebration in a glass. Bailey's Irish Cream, iced coffee, and Guinness gelato create a drink that's like an adult milkshake. If you can't find Guinness gelato, coffee ice cream will work just fine. You may have tried traditional Irish soda bread, which is tasty as it is. But adding Guinness gives it a deep, slightly bitter flavor that makes the already buttery breakfast treat even more of a special-occasion bread. Serve it for breakfast or brunch on St. Patrick's Day or as a nice more savory contrast on your dessert table. While this recipe calls for draft beer, the canned or bottled kind is fine. Adding Guinness to these surprisingly light brownies deepens the chocolate flavor without making them too hoppy. They're simultaneously fluffy and mousse-like, while decadent and rich, like your favorite fudge brownie. And you won't need an entire beer to make the recipe, so you can enjoy a little St. Patrick's Day tipple as you prep and bake! If you're hosting a grown-up party for St. Patrick's Day, this impressive layered mousse will top things off perfectly. This creamy chocolate dessert is served at the Guinness Storehouse in Dublin, Ireland, so it's an authentic taste of the old country. It does require at least two hours to chill, so make sure you plan ahead. The bitterness of Guinness deepens the chocolate decadence in this rich and delightful cake, while orange adds a contrasting hint of citrus. Serve this cake with some fresh whipped cream to mellow out its slight bitterness. If you really want to get St. Patricks Day going, add a little Bailey's to the whipped cream. Start with a cake mix and add chopped-up mint cookies for this easy and St. Patrick's Day-appropriate treat that's perfect for kids. Topping it all off with a green frosting makes it extra festive. Make sure you beat the frosting well, for that finger-licking fluffy texture. The recipe works well for a larger cake too; just adjust the bake time accordingly. You can't get a more traditionally Irish dessert than a sweet and custard-y bread pudding. This one made with Irish cream will be a hit at your St. Patrick's Day get together. It's a great way to use up bread that's going stale or you can opt for white, raisin, or even challah for an even sweeter aroma. Serve it warm with a little vanilla ice cream for a special treat. One taste of this Bailey's white fudge, and you'll think you reached the end of the rainbow. It's melt-in-your-mouth creamy, rich, and the alcohol bakes off so you don't have to worry about little fingers sneaking a taste. This is a variation on a basic white fudge, so you can make it without the liqueur if you don't enjoy the flavor.